What an enigma of a man! 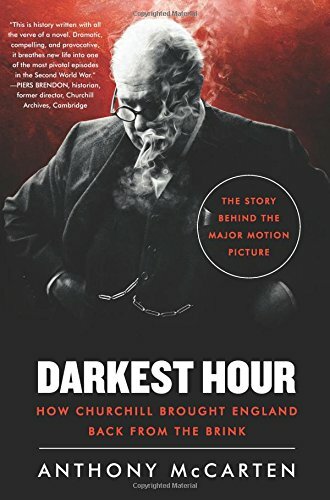 I watched the movie, The Darkest Hour, and was struck by how much I didn’t know about Winston Churchill. There were references in the movie about Churchill, his father and family that I wondered if they were matters of fact or fiction. Personally, I agree with the author that Churchill prepared for this moment in history whether he knew it or not. The man was loved by his wife and people even though others disliked and ignored him. I found him to be a man who took learning in a school setting with little interest, but in the world as a young man he thirsted for knowledge. Churchill would have his mother ship books to wherever he was, so he could read and learn. The amount of writing Winston did is astounding let alone a lot of what he did was written at a young age. The wealth of insight the man had and heart of a patriot is so deeply touching. Clemmie, his wife, was a special woman who adored her husband. This book didn’t talk a lot about his children, though he has many descendants. There have been many books written about him and by him. To me, that speaks of man who few can explain easily with a book. Lord Halifax is definitely a man I wouldn’t have wanted to work with, and frankly Parliament is hard for me to comprehend. I would recommend this book if you haven’t done much reading about the man Winston Churchill as this is a good place to start. I found the information easy to understand and written to be very engaging. I plan on learning more about this unique person. Here is man Britain had at a time they truly needed him. He withstood enemies, both within the government and without. However, looking back we see a man who was brave and brought his nation back from the brink of extinction!